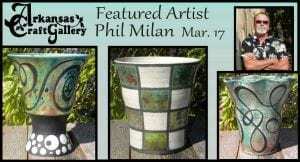 March 17 from 10-5 at the Arkansas Craft Gallery in Mountain View, our Featured Artist will be Phil Milan. Phil is a multi-talented artist working in wheel-thrown pottery, using raku firing, a method developed in Japan. During firing the work is removed from the kiln at bright red heat and placed in containers of combustible materials, which subjects it to reduction (or smoking), and blackens the clay, causing crazing or fine lines in the glaze surface. “The designs come from my love of ink drawing and creating patterns from geometric and organic shapes and lines. I use the raku firing to emphasize the unglazed portions which turn black during the firing process.” Phil’s style developed from 25 years of working with clay and teaching pottery classes as art teacher at Harrison High School. 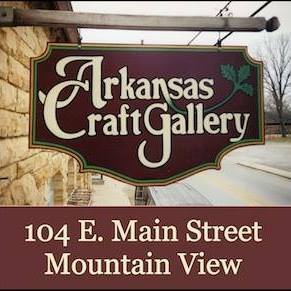 He took a college course of hand-built pottery and a course of raku pottery from L & R Specialties in Nixa, MO. His degree from Northwestern State University in Natchitoches, Louisiana is in Advertising Design with art education certification, secondary science certification and post-graduate hours. Milan was born in south Louisiana, and spent his childhood years in west Texas, his teenage years in Pine Bluff, Arkansas. Milan loves living in the Ozarks. He also enjoys woodworking, sculpture, and drawing. He recently retired after twenty-nine years of teaching, in Arkansas and Louisiana. In addition to creating art, he enjoys hiking, canoeing, camping, bicycling, fishing and traveling. He is married to his wife Ginger, a retired history teacher. They have two grown children.